Official dates for the “America’s Most Wanted” Tour have just been announced! The extensive tour kicks off on July 9 in Birmingham, AL, at the Oak Mountain Amphitheatre, and doesn’t wrap up until September 1 with a gig in Irvine, CA, at the Verizon Wireless Amphitheatre. Most of the venues on the docket are similar large, outdoor spaces, including a stop at SPAC in Saratoga Springs, NY, on August 3, and the Austin 360 Pavilion on August 17. Both Weezy and T.I. will spend their fair share of time throughout all parts of the country, with the first leg taking place throughout the East and South East coasts. We can’t help wonder if Young Money is biting off more than he can chew after his recent brush with death. Hopefully the misguided rapper doesn’t turn to the sizzurp for answers. In any case, check below for tour dates and tickets as they become available on the secondary market. 7/9/13 Birmingham AL Oak Mountain Amph. 7/12/13 Atlanta GA Lakewood Amph. 7/13/13 Tampa FK Live Nation Amph. 7/14/13 West Palm Beach FK Cruzan Amph. 7/23/13 Bangor ME Bangor Amph. 7/26/13 Charlotte NC Verizon Wireless Amph. 8/7/13 Cleveland OH Klipsch Amph. 8/10/13 Chicago IL First Midwest Bank Amph. 8/11/13 St. Louis MO Verizon Wireless Amph. 8/13/13 Indianapolis IN Klipsch Amph. 8/17/13 Austin TX Austin 360 Amph. 8/24/13 Albuquerque NM Isleta Amph. 9/1/13 Irvine CA Verizon Wireless Amph. Bouncing back from a recent health scare, in which he was hospitalized for seizure-like symptoms, Lil Wayne has released a video announcing a new round of summer tour dates. The can’t-keep-him-down rapper will head out on the America’s Most Wanted Tour alongside fellow hip-hop superstar T.I. No specific dates have been announced yet, but we do know Lil Tuneschi’s planning on kicking things off this July, which could mean ‘America’s Most Wanted’ may extend all the way into fall. Good news all around. Tickets to Lil Wayne’s summer shows – and then some – are on sale now, so don’t forget to scroll through our list of discount links below! Unfortunately, the magazine’s shindig is invite-only, but we can offer tickets to some of Lil Wayne’s international shows, as well as to Super Bowl XLVII! Setting out to promote one of the most anticipated albums of the new year, Lil Wayne will embark on a European tour this coming spring. I Am Not a Human Being II, slated for a February 19 release, is Wayne’s 10th studio record and, apparently, almost his last. The rapper, who suffered from “seizure-like symptoms” while flying over Texas in October, has publicly stated the followup to I Am Not a Human Being II, entitled The Carter V, will be his final album. In other words, 2013’s global trek, and a future 2014 (2015?) tour in support of the ultimate Carter effort, are sure to make headlines, generate even more buzz, and most importantly, sell out fast! The young Carter clan will have to do without their dad for a good month before his official retirement, however, as Wayne’s not done yet: his first round of 2013 tour dates kicks off in Dublin March 3, to be followed by stops in Toulouse, Oslo, Paris, and Amsterdam, among other sites, through the end of the month. Look for even more shows to be added in the weeks ahead, including a full list of North American concerts. Shortly after Lil Wayne completed his North American tour during the spring of 2011, he announced that he would once again be touring the States, stopping at over 20 location throughout the summer. The biggest difference from the spring tour is that almost all of the shows were played at amphitheaters. The Lil Wayne tour 2011 probably played a significant part in delaying Tha Carter IV, the supposed last album of his career (explaining that his children were the reason and he “would feel selfish still going to the studio when it’s such a vital point in [his four kids’] lives, not to be there”). 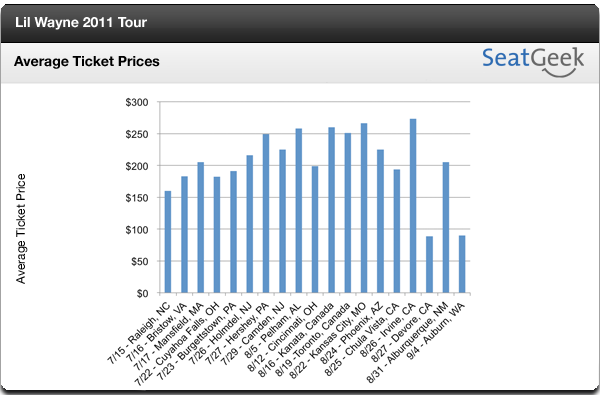 Top priced concerts are Irving, CA and Kansas City, MO at $273 and $260, respectfully. Why were the ticket prices so low in Devore, CA and Auburn, WA? They are averaging $89 and $90. I can drive 45-minutes from Irvine to Devore and pay about a third of the price. Perhaps the demand for California tickets lost pressure on his third show in the state. At first, I thought the performance of Rick Ross and Keri Hilson would drive prices up for the dates they are touring with Lil’ Wayne. But apparently not. (Remember: “I’m all I trust”). Eminem Lil Wayne Announce 2012 World Tour, No Love for US?